Jan Bakelants was the surprise winner of Stage 2 after breaking away in the final few kilometres before producing a gutsy finish to hold off the charging sprinters. His win not only gives him a stage victory, but also means that he moves into yellow ahead of Stage 3, upsetting Cannondale’s plans to put Sagan into yellow ahead of the team time-trial. 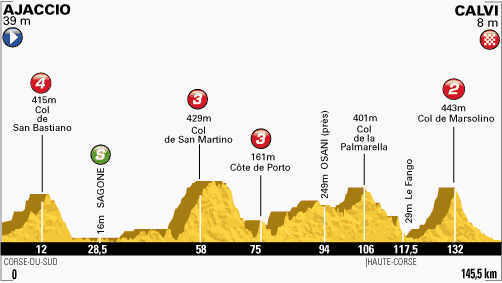 Stage 3 is the last stage in Corsica, but is likely to follow a similar course to that of today. The early category 4 climb should enable a breakaway to escape, while the climb of Col de Marsolino just 15km from the finish should shed the pure sprinters. It is only a short climb, but an average gradient of 8.3% means that the likes of Cavendish, Greipel and Kittel will find themselves adrift once again. The descent is a tricky one on narrow roads and we could well see an opportunistic attack from someone here in the hopes of a stage victory. Cannondale are unlikely to make the same mistakes in Stage 3 as they did today. Once again, Peter Sagan is the strong favourite for this stage and he showed that he is the fastest sprinter in the group that is likely to make it to the finish. Despite not catching Bakelants, he outsprinted Kwiatkowski, Cimolai and Boasson Hagen to take second. Assuming Cannondale can work to prevent any breakaway staying clear, it is tough to see who will stop him. The man that came closest was the Pole, Michal Kwiatkowski, who clearly has a great future. 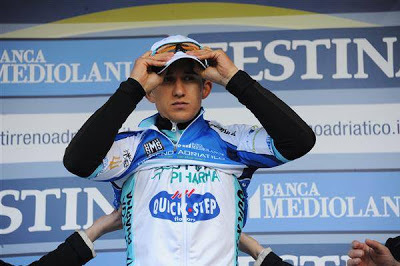 He is one of two options that Omega Pharma Quick-Step have for this stage along with the Frenchman, Sylvain Chavanel. I suspect Chavanel may have a go on the descent, and should that fail, help Kwiatkowski go for the win in a sprint against Sagan. Edvald Boasson Hagen finished fifth today and will likely challenge again tomorrow, but with the lack of a dedicated lead-out and the focus securely on ensuring that Chris Froome stays out of danger, the task of winning the stage seems just out of reach. BMC put their trust in Philippe Gilbert today, but the Belgian struggled to a disappointing 18th place and I cannot see that he will improve enough to take the win tomorrow. The likes of Pierre Rolland and Thomas Voeckler will likely attempt to get away on the final climb, with Rolland particularly keen to hang onto his King of the Mountains jersey, but I would be surprised if a breakaway were to succeed on this climb. The other team that may look to do something on this stage is Orica GreenEdge. With Daryl Impey, Michael Albasini and Simon Gerrans, they have plenty of options. It was Impey that was the main man today, but I suspect Gerrans may be the man that they focus on tomorrow. He already has a couple of victories this year and will come into this race in good form.